Myrtle Beach native, Drew Brophy, has been producing art professionally for 25 years, and the Art Museum is proud to present a retrospective exhibition of his incredibly vast career in art titled Making Waves | A Drew Brophy Retrospective. Beginning with some of his earliest sketches and paintings and continuing through his surfboard painting explosion in the 1990s to his most recent “sacred geometry” body of work inspired by the mathematic and physic discoveries of ancient cultures, the exhibition will feature a variety of over 50 art objects, including surf boards, skate decks, wake boards, poster art, T-shirt designs, logo designs and more. 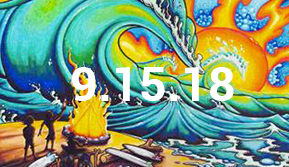 Join us for an artist-led tour of Making Waves | A Drew Brophy Retrospective this fall! All tours are free and open to the public. Call the Art Museum at 843.238.2510 with any questions.